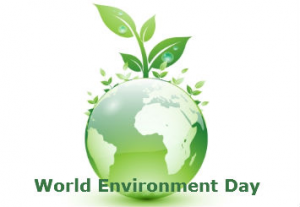 Taking care of the environment is one of the most important things we can do, and many of our carpet and hardwood manufacturers create environmentally friendly flooring. Shaw, Mohawk, Armstrong, and IndusParquet are just a few of the manufacturers who create products that help the environment. 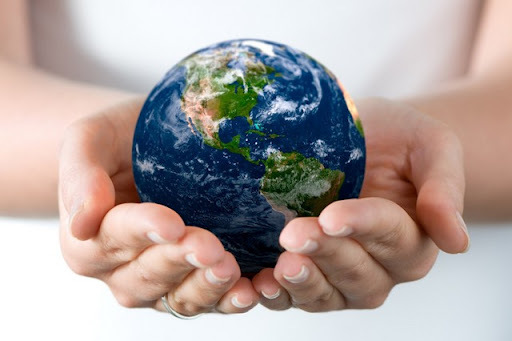 Shaw Industries has many environmentally friendly products, which are Cradle to Cradle certified. Cradle to Cradle focuses on designing so that waste is never an option. 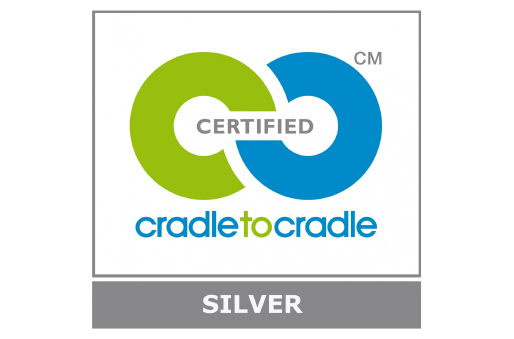 Cradle to Cradle creates products that will be deconstructed and recycled back into their original materials over and over again. Here are some of Shaw’s Cradle to Cradle certified products: Anso Type 6 Nylon fiber, Eco Solution Type 6 nylon fiber, EcoWorx carpet tile backing, EcoWorx Broadloom, EcoWorx Performance Broadloom backing, Zeftron Nylon fiber, and Epic hardwood. Anso nylon carpets are some of Shaw’s most popular green products. All of the carpets and area rugs made from Anso nylon can be recycled at Shaw’s Evergreen Nylon Recycling facility. Evergreen enables Shaw to recycle post-consumer carpet back into new carpet over and over again. Click here to see our collection of Shaw Anso Nylon carpets. Another Shaw carpet fiber that helps the environment is the ClearTouch fiber. ClearTouch carpets are made of PET plastic from recycled soda and water bottles. ClearTouch carpets are very soft, and they also help reduce plastic bottle waste. ClearTouch PET carpets contain a minimum of 25% recycled content, and the ClearTouch Platinum carpets contain a minimum of 50% post-consumer recycled content. Click here to see our collection of Shaw ClearTouch carpets. Another Shaw product that helps the environment is the Shaw Epic hardwood collection. This engineered hardwood uses 50% less newly harvested wood than conventional engineered flooring. 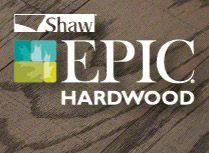 Click here to read more about Shaw Epic hardwood. Mohawk SmartStrand carpets are also green products. 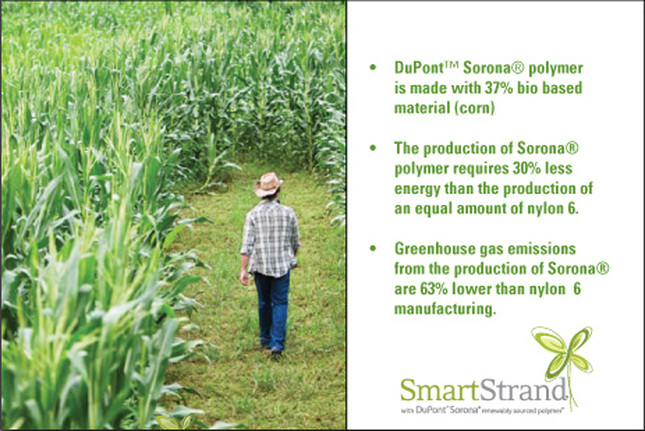 The SmartStrand fiber is made in part with annually renewable plant-based materials that minimize the usage of limited natural resources. Using renewable plant-based materials allows Mohawk to reduce energy consumption. 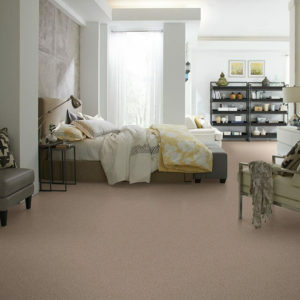 SmartStrand carpets are durable, beautiful, and beneficial to the environment. 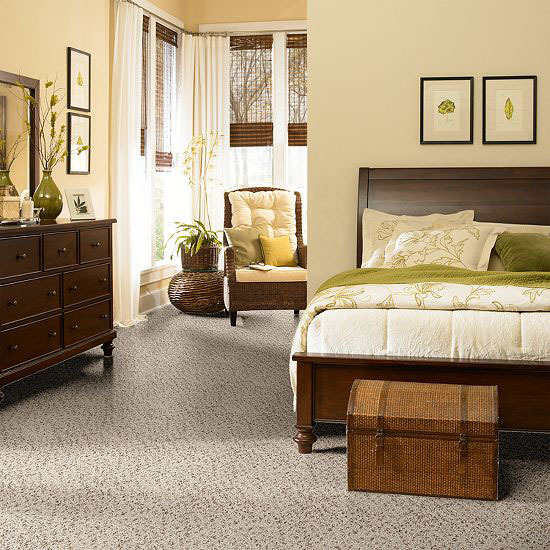 Click here to see our collection of Mohawk SmartStrand carpets. 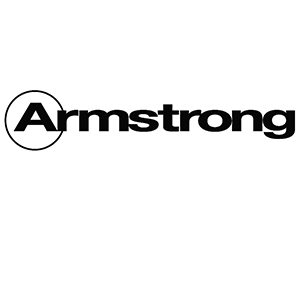 Armstrong is another manufacturer who helps out the environment by practicing sustainable forest management. They also help reduce the impact of logging practices. The majority of wood that Armstrong uses in their domestic hardwood flooring is sourced from the Appalachian hardwood region, where the growth rate is an average 2+ trees for every tree harvested. Also, their engineered hardwood flooring is certified as a low-emitting (low VOC) wood product. IndusParquet is another hardwood manufacturer that focuses on helping the environment. IndusParquet operates in compliance of government regulations, assuring that the natural resources used in the production of IndusParquet products are manufactured efficiently with minimum impact on the environment. The timber harvest in Brazil is strictly controlled by the government, and the harvest is limited to a maximum of eight trees per 3/4 acre. 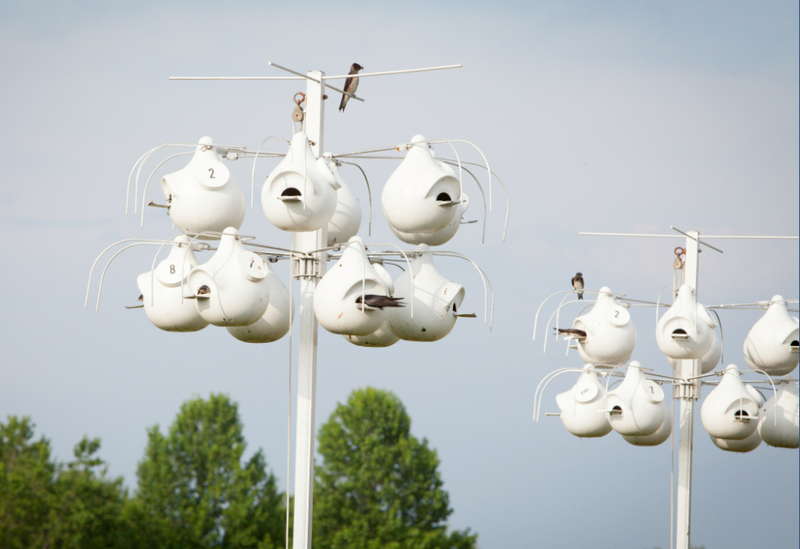 Endangered trees and trees that provide food for animals are preserved. They are not allowed to be harvested. Also, every tree that is harvested is tagged with an ID code that stays with the tree throughout the manufacturing process. In addition, IndusParquet has adopted a zero waste policy. 100% of all the wood that enters the factory is used. IndusParquet also owns three vast reforestation plantations to help assure a sustainable resource. Make sure to look for the “Made in Brazil” mark for exotic wood flooring made to protect and preserve the environment. Click here to see our collection of IndusParquet hardwood. These are only a few of the manufacturers who have programs and production methods to help the environment. If you would like to know more information, please check out each manufacturer page or leave us a comment below. You can also call us at 1-800-922-5582 for more information. I hope everyone has a wonderful World Environment Day! 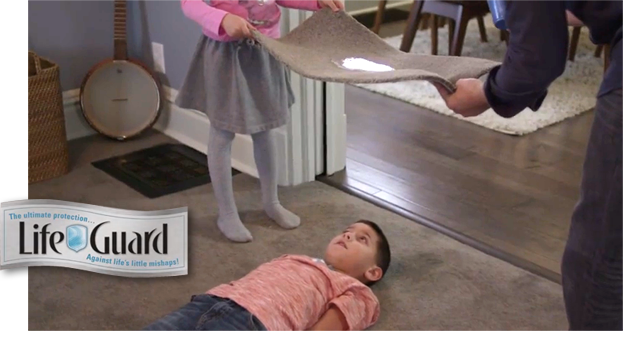 Life Happens is a new residential carpet collection from Shaw that features their new LifeGuard protection system. LifeGuard is a revolutionary protection system that covers the entire product, from face fiber to backing. All of the Lifeguard carpets are treated with Shaw’s patented R2X Stain and Soil Resistance protection. In addition, the thermoplastic backing gives the carpet a waterproof barrier that prevents liquids from soaking into the carpet padding and the subfloor. The LifeGuard’s patented backing system keeps liquids from seeping into the carpet backing, which allows for an easier cleanup and protection against odor-causing spills and pet accidents. 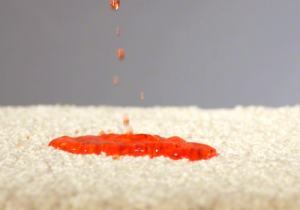 In addition, the R2X Stain and Soil Resistance System gives the carpet an exceptional level of liquid stain resistance because of the liquid will stay on the surface of the carpet, just like the picture shows below. Since the liquid will stay on the top of the carpet and not soak through the backing, you will have more time to discover the spill and clean it up. After the mess has been cleaned up, the carpet will dry quickly. The Life Happens carpets also combat household odors, and they retain their appearance because of the Anso CrushResister High Performance Nylon. These carpets are resistant to becoming fuzzy, the carpet tufts resist being pulled out, the edges will not ravel easily, and the carpet/backing is less likely to suffer delamination. In addition, the carpet is easy to install because the backing is flexible. This carpet bends well so it is perfect for stairs, and the softness of the carpet backing helps protect painted baseboards and door casings. The LifeGuard products are designed to be recyclable at the end of their lives. Every part of the carpet is completely recyclable, and they are Cradle to Cradle certified. The video below will explain more about how the carpet is recyclable and Eco-friendly. Here are the warranties for the carpets in the Life Happens collection. Lifetime Warranties: Waterproof Backing, Stain & Soil, No Wrinkle, No Edge Ravel, No Delamination, and Tuft Bind. There are many beautiful carpets to choose from in this collection, and they feature the newest design and color trends. Click here to see the Life Happens collection from Shaw. EPIC is an engineered hardwood from Shaw that is a true breakthrough in hardwood manufacturing. This engineered hardwood is stylish and it has many great advantages. 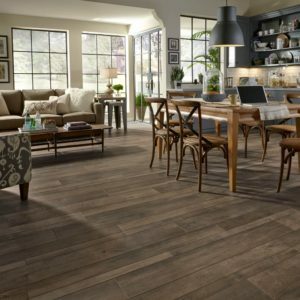 EPIC flooring is Eco-friendly, durable, and dimensionally stable. Also, this engineered hardwood uses 50% less newly harvested wood than conventional engineered flooring. In addition, Shaw’s EPIC engineered hardwood has a ScufResist Platinum finish. Shaw’s EPIC hardwood uses 50% less newly harvested wood than conventional engineered flooring and it is made with EnviroCore. EnviroCore is a high-density core board, which is made from recycled post-industrial wood fiber. 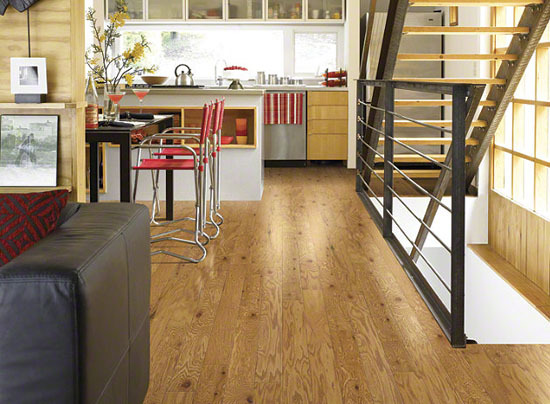 This engineered hardwood is made in the United States with wood harvested from well-managed domestic forests. EnviroCore’s recycled wood fibers are tightly compressed, which makes the EPIC products harder, denser, and they perform well. The Janka Hardness test proved that this flooring is harder than solid and engineered flooring products that feature softer core boards. The ScufResist Platinum finish helps the product resist wear and scuffing very well. The product’s density helps it stay more stable as the seasons change. Epic collections have great style, design, and gorgeous colors. 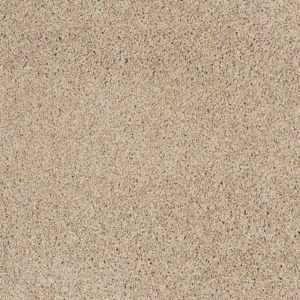 This product is offered in a wide range of finishes, from traditional to rustic, and from smooth to distressed and hand-scraped. Click here to see Colonial Oak 3.25″. Click here to see Colonial Oak 5″. Click here to see more Shaw hardwood products. On November 5, 2014, Armstrong Flooring’s Kankakee, Illinois manufacturing facility received the 2014 Illinois Governor’s Sustainability Award. The Illinois Governor’s Sustainability Award, which is presented by the Illinois Sustainability Technology Center, honors organizations that have demonstrated a commitment to environmental excellence through outstanding and innovative sustainability practices. The Armstrong Kankakee Manufacturing Facility was giving this award for their efforts to reduce waste, both internally at the manufacturing facility and externally through the Armstrong Recycling Program for Vinyl Composition Tile (VCT) Flooring. The Armstrong Recycling Program for VCT is designed to reduce environmental impacts by keeping flooring products out of the landfill through a closed-loop recycling process. Armstrong flooring and qualifying competitors’ flooring can be recycling through the program. The Armstrong Recycling Program also helps reduce environmental impacts by decreasing energy consumption, which means fewer natural resources are consumed and fewer greenhouse gas emissions are produced compared to the use of virgin raw materials. 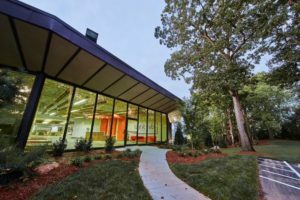 So far, the Armstrong Recycling Program has recycled over six million pounds of post-consumer VCT in North America through its closed-loop process. Shaw’s Anso nylon is a durable and resilient fiber, and it is also exceptionally soft. Nylon comes in a wide variety of textures and colors, which makes it a perfect choice for every lifestyle. 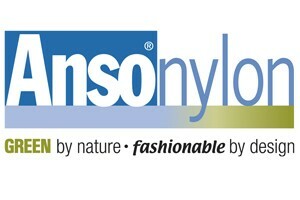 Anso nylon was created in a way that it can be recycled, and it is an environmental friendly fiber. The Anso nylon fibers are certified cradle to cradle, which means they can be recycled over and over without end. This fiber also has a high level of resilience and it maintains its original shape and new appearance for a long time. Anso nylon has more than 40 years of carpet manufacturing experience and it has an extensive warranty package, which gives customers a peace of mind when purchasing carpet made of Anso nylon. 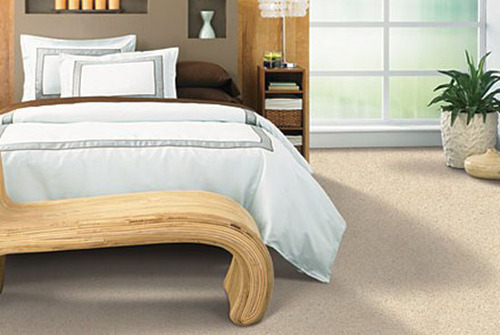 the patented R2x treatment gives the fibers unsurpassed stain resistance. The R2x treatment helps Anso nylon repel dirt and soil, and it also helps the Anso nylon wear gradually. Having a busy lifestyle is not a problem for Anso nylon because it is made to last. The nylon 6 fibers make it twenty percent tougher than most fibers and it shows less wear over time. 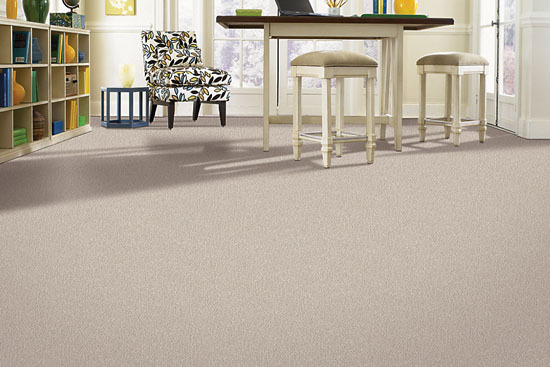 Click here to see our Shaw Anso Nylon carpet. This week is our annual Fall Sale. The sale starts on Monday September 8th and it ends on Saturday September 13th. Both store locations will be open Monday through Saturday. Different specials will be appearing all week online and in stores. 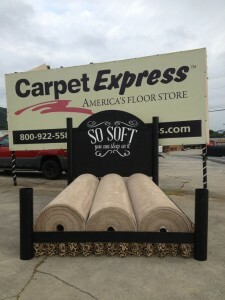 We will have some wonderful deals on our Carpet Express Showcase collections on soft carpet, vinyl, hardwood, etc. 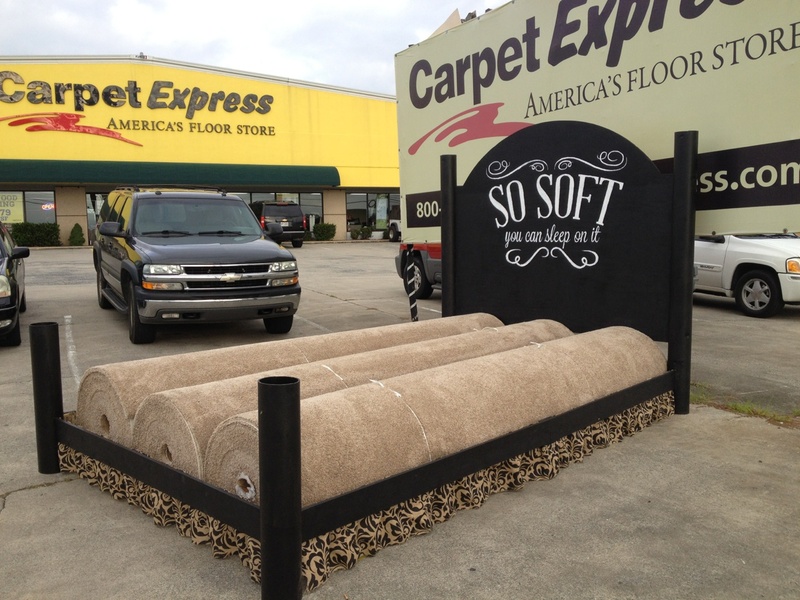 We have five different styles of ultra soft carpet in our collection. 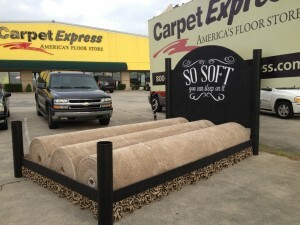 If you happen to stop by or drive by the Connector 3 location, you will see a unique display showcasing some of our soft carpet. Feel free to stop by and take a picture or get your picture made with the neat display. In addition, on Thursday, Friday, and Saturday, both store locations will be serving some delicious grilled hot dogs. 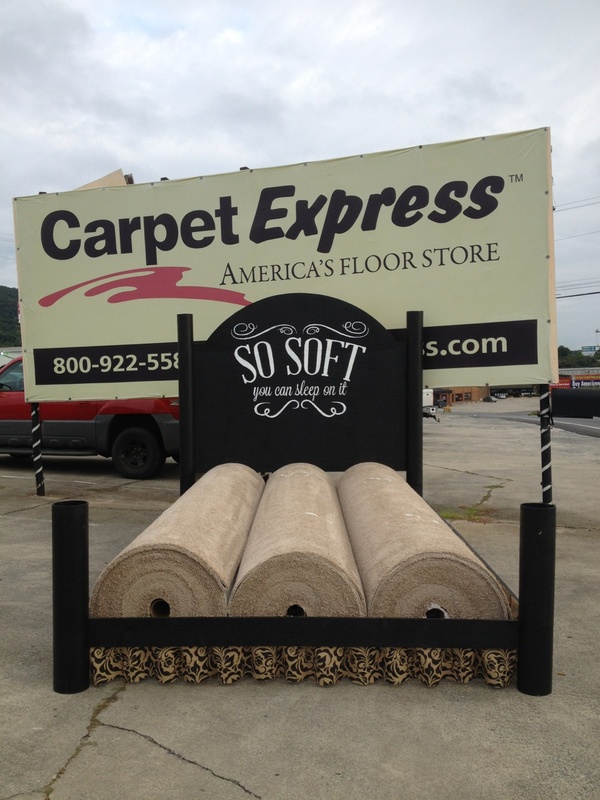 Click here to see the soft carpet in our Carpet Express Showcase Collection. 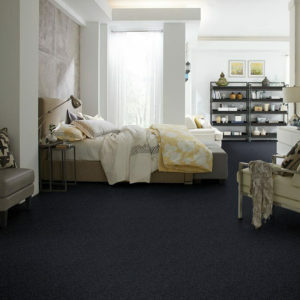 Click here to see all of the products in our Carpet Express Showcase Collection. River rocks are smooth and round because of the natural erosion, which occurs because of the water rushing past the rocks. These beautiful stones can do more than just sit in a river and have fish swim by them. You can take these rocks and create a gorgeous flooring in your bathroom, your kitchen, or even on your walls. An easy way to use small river rocks is to mount them on flexible webbed sheets, which will make it easier to install the rocks as tiles that have even grout lines. If you prefer larger stones, then you can individually install and grout the stones. The river rocks use the same installation materials as manufactured tile. The adhesive is a thin-set mortar, and tile grout or mortar is used in the grout joints. If you seal the stones before grouping the clean up process is easier. A proper underlay for this type of flooring is concrete backer board, but if you only use river rock flooring in small areas then you don’t need it. 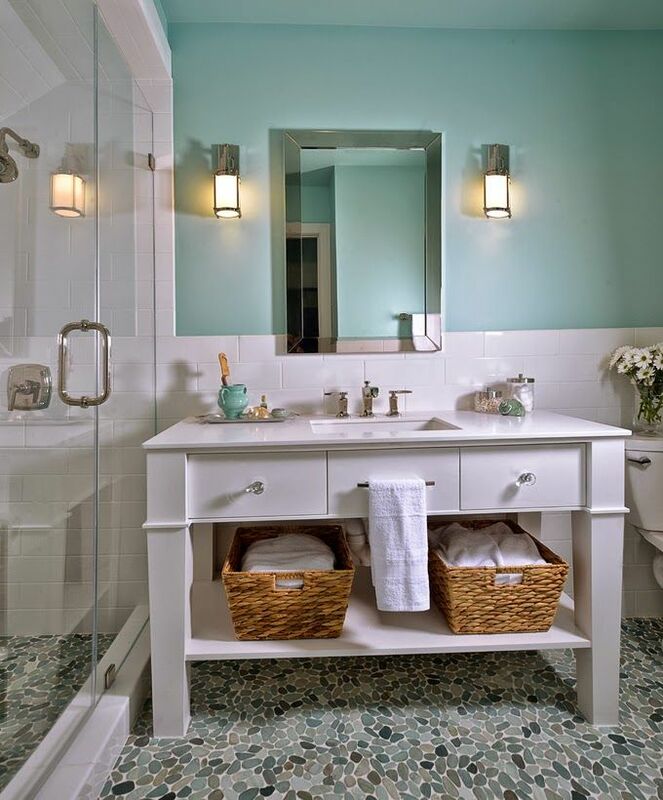 You can use river rocks as an accent in the bathroom. The river rock can be formed into a small rug in front of the shower or bathroom sink, which will blend in well with the other flooring in the bathroom. If you use river rock tiles as your shower flooring, then try to pick stones that are really smooth so cleaning is easier. Also, try to buy stones with a shine to them so they stand out better in the shower. If you are tiling the entire floor, you will make the room cooler so you might want to buy a few thick scatter rugs. The scatter rugs will add some warmth and cushion to the room. Large rooms can use small or large river rocks well as the flooring, but small bathrooms look better with smaller rocks. 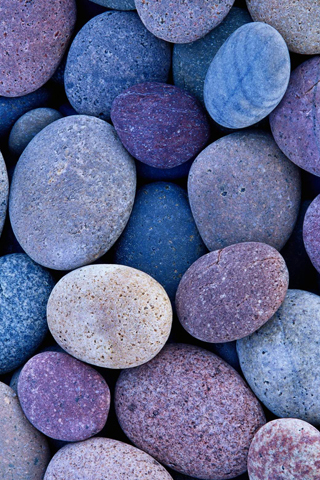 River rocks come in all shapes, sizes, and colors so be creative! You can mix any of the rocks together or you could cover the floor with one type of rock and use another one as an accent. 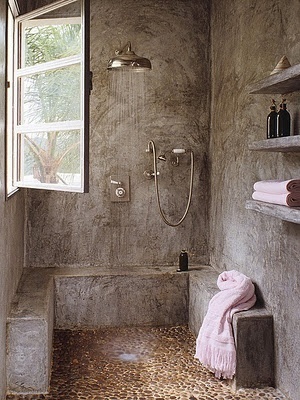 If you tile the bathroom floor and shower then use a larger stone for the bathroom and a smaller stone for the shower. Click here for our rugs. Mohawk Industries’ commitment to sustainability has caught the attention of Newsweek. Newsweek recognized the company in the magazine’s fifth ranking of the 500 “greenest” U.S. companies. Mohawk has been the highest ranked flooring manufacturer during each year the rankings have been released. The Newsweek rankings use key indicators to measure the environmental performance of large publicly-traded companies. These companies are delivering solid business results while minimizing their environmental impact. The focus of the rankings is how efficiently businesses manage their resources. 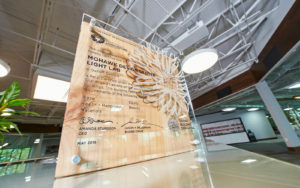 Mohawk ranked 314 in “Green Rankings 2012,” which was the last year Newsweek complied the list. This year Mohawk’s ranking is 241, which is the highest it has been since 2010. Newsweek and Corporate Knights Capital revised the metrics used to calculate the 2014 rankings. The new revision makes the comparisons between manufacturing companies, financial services, technology, and other sectors more equitable. Mohawk promotes a “no waste culture.” Seventeen North American facilities do not send no process waste to landfills. 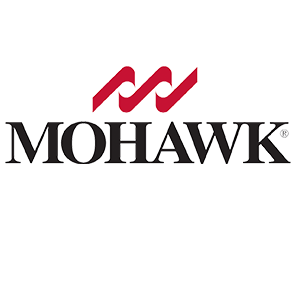 Mohawk plans to increase that number to twenty-eight by the end of this year. 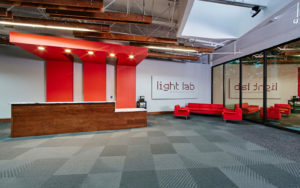 In addition, the company has created goals to reduce waste, lower water, energy, and greenhouse gas (GHG) intensity. Mohawk has reduced energy and greenhouse gas intensities by focusing on reductions, improving efficiencies, and utilizing cleaner fuels. Click here to see our Mohawk Carpet. Click here to see our Mohawk Hardwood. Click here to see our Mohawk Laminate. Click here to see our Mohawk Tile.